FTP is used to upload files to Primcast hosted websites and media streaming servers. This article will give you some basic instructions for uploading files from your local computer to your Primcast web hosting or media streaming servers account. Now you need to enter the server information on the main FileZilla window. At the end click the Quickconnect button, and you will be connected to your ftp server. 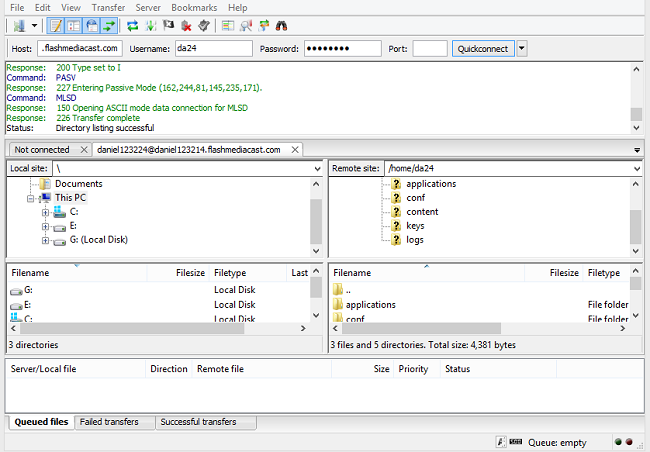 Then, use the middle area of the FileZilla window to move files back and forth. The left hand side of this area represents files on your local computer. At the top, your directory structure is displayed. Below, files in the currently selected directory are displayed. You can click on a file or folder with your mouse, (left button), and then drag it to the right area of the window to upload it to your server. To upload multiple folders or files which are not in a continuous list, hold your keyboard's Ctrl key down and click each file and/or folder you wish to upload, then drag and drop them in the usual way. Be sure that you've navigated to the proper location on the remote server before dragging files over to the remote server.